Sylvia Ji's "Las Adelitas" exhibition, is finally at the Joshua Liner Gallery in NYC! Her dark and delectable darlings are so eerie and beautiful makes me want to cry. Sylvia Ji is a master of capturing the dark side of the beautiful and the sublime. 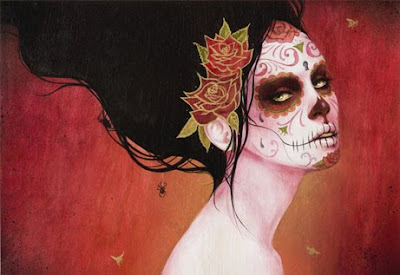 Macabre ‘Day Of The Dead’ catrinas intermingle with exotic empresses, with a regal elegance. Ji’s imagery is a visual elixir of life and death, combining sacred symbolism with mystical glamour and opulence. Influenced by historical costumery, Ji incorporates Baroque detailing such as luxurious tapestries, ornamental feathers, and gold leafing into her work for a more elaborate and decorative effect. By subway: C / E to 23rd Street or A / C / E to 34th Street at 8th Avenue. Open Tuesday — Saturday, 11 — 6PM.